The leading contingent of the parade was formed of the recipients of the Param Vir Chakra and Ashok Chakra awardees. seven marching contingents including mounted horse cavalry. 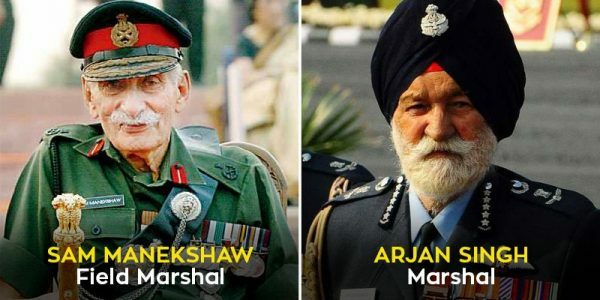 The highest rank attainable in the Indian Army is Field Marshal. Ranked as a Five Star General Officer, a Field Marshal is ranked above a General. This rank has been conferred on only two individuals. The highest rank attainable in the Air force is the Marshal of the Indian Air Force. It is mostly awarded in a ceremonial capacity. MIAFs are ranked immediately above the Chief of Air Staff. Admiral of the Fleet is the highest attainable rank in the Naval force. This Five Star rank is primarily conferred in wartime and honourary capacity. This rank has never been conferred on any individual in the country. Maha Vir Chakra – The Maha Vir Chakra (MVC) is the second highest military decoration in India and is awarded for acts of conspicuous gallantry in the presence of the enemy, whether on land, at sea or in the air.